The SeceuroShield 77 is the supreme multi-purpose shutter. Applied as single or double insulated garage doors, high security domestic shutters, medium security office entrances, external shopfronts and room dividers, the SeceuroShield 77 can be installed for multiple functions. The curtain slats in the SeceuroShield 77 are a double-walled foam filled aluminium slat. The bottom slat consists of extruded aluminium with a rubber bottom seal. The slats can also be mixed with the SeceuroShield 8000 slats if partial vision is required through the shutter to display shopfronts or for security reasons. The SeceuroShield 77 uses the UPH 250 guide rail. The UPH 250 is recommended for wider shutters with higher security requiment with 250mm, 300mm or 350mm box. It consists of extruded aluminium with an integral box section for reinforcement and to facilitate fixing. It also has a high density 4mm or 7mm pile brush for quiet and smooth operation. The dimensions are 90mm wide x 34mm deep. 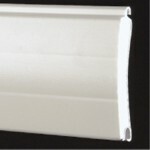 This guide rail on the SeceuroShield 77 is available in the stock colours of white and brown. Description: CD77 is a double skin foam filled aluminium non-vented slat. The CD77 slat can be mixed with the CD800 punched slat that has apertures of 149mm x 55mm, which is also available with a polycarbonate insert to offer a partial vision section to the shutter. 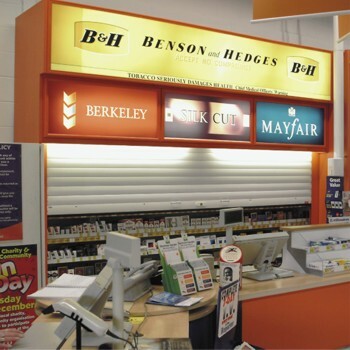 Common Use: High security domestic window shutters/garage doors, medium security commercial and office applications. Dimensions: Nominally 78.5mm high x 19mm thick. Weight: 5kg per square metre. Stock Colours: White, Brown, Light Beige, Burgundy, Fir Green, Navy Blue, Black and Medium Oak Woodgrain. Motors: Draw 240 volts and 0.5 - 2.5 amps dependant upon the shutter size. Complete with integral limit switches, thermal cut-out to prevent overheating and 2 metres of cable for connection. Guide Rails: 3 fixings for guide rails up to 1000mm in length, 5 fixings for guide rails up to 2000mm in length etc. Shutterbox: The shutterbox is fixed at each end and 1000mm centres if over 2000mmwide.